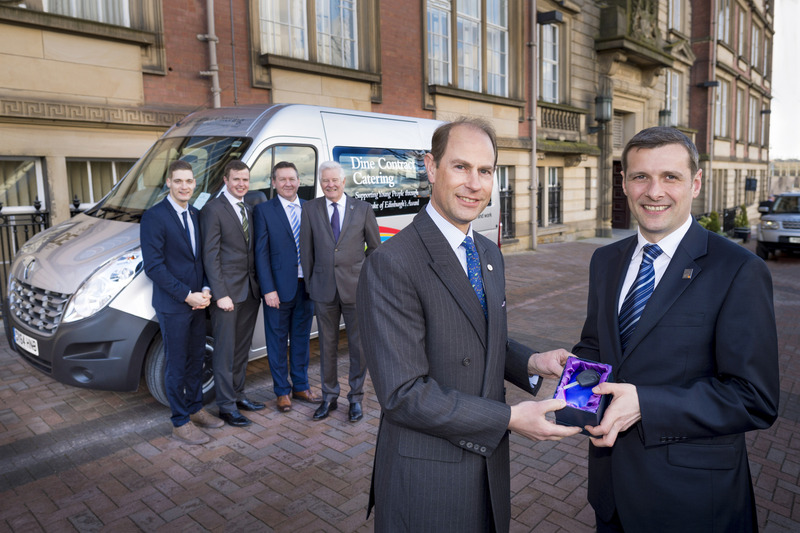 On Tuesday 24th March, His Royal Highness The Earl of Wessex attended the official handover of a new minibus for The Duke of Edinburgh's Award, sponsored by Warrington-based, entrepreneurial operator, Dine Contract Catering. The handover took place at County Hall in Preston and was followed by an address by The Earl in which he thanked the award winning contract catering company for its ongoing support in helping the young people of today. The sponsored bus will allow even more schools and youth groups to join the challenging expeditions organised by the Duke of Edinburgh’s Award. Dedicated to helping people between 14 and 24 years old, the Award is aimed at giving young people the life and work skills they need to reach their full potential. Many of those who benefit are from a disadvantaged background. Ian Cartwright, Dine Contract Catering’s Managing Director, commented: “We’re delighted to sponsor the new minibus and help even more young people across Britain achieve their Bronze, Silver or Gold awards. The work of this brilliant charity links back with the ethos of our own company – to help provide young people in the catering sector with the tools, knowledge and confidence they need to forge successful careers in the future.